Nothing seems right. Ever since you crashed your car during that heavy rainstorm, the world has become a dreary, frightening place. The mere fact that you spiraled off a slippery cliff, landed in a mucky ditch and survived is strange on its own. You leave your car behind and start exploring the dark forest that surrounds you, looking for a sign of life. You meet a pale girl who tells you, no matter what, don’t enter the nearby hotel. Things just keep getting creepier and more sinister as you continue walking, and that’s when you realize, you’re in Phantasmat. Desperate to find a way out of this nightmare, you go to the hotel despite the girl’s warning – just to use the phone to call for help. The hotel is rundown, decaying and most definitely haunted. It stands on a hill that overlooks a drowned city that is now deserted. Although the creepy hotel owner tells you that the catastrophe happened recently, you’re skeptical. It looks like this hotel has been abandoned for quite some time. 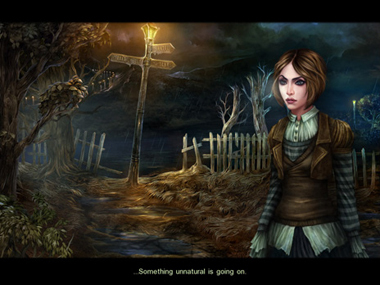 Your innate survival skills kick in and you quickly become immersed in this Hidden Object game adventure. The only way to find your way back to safety is to solve the mystery of what happened to the pale girl, the hotel owner, an odd old woman and the rest of the submerged city. As you try to save yourself, you’ll come across old newspapers, audio tapes and secret notes that will help you reveal the truth. But strangest of all, you’ll have flashbacks that will slowly reveal what really happened. 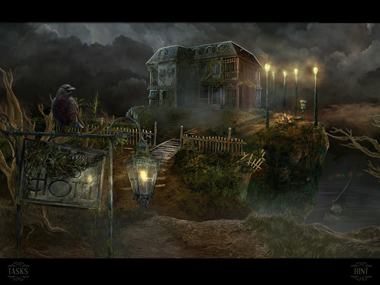 Game play in Phantasmat is a combination of traditional Hidden Object games and point-and-click adventure. You can move around freely in the hotel and forest, picking up useful items and zooming in on glowing areas that take you to a Hidden Object scene. But there’s one more exciting added twist: you can switch from Hidden Object to Match 3 style gaming and back as you clear away items! Let’s say you’re playing a scene in Hidden Object mode and you get stuck. Switch over to Match 3 and as you clear golden eyes from the grid, items will get crossed off your search list. How convenient and flexible is that? Here’s an important tip – playing in Match 3 mode will boost your Hint meter quicker, so it’s worth it to switch over now and then. Phantasmat is filled with beautiful, dark imagery. You never know what will jump out at you with every turn. Are the paintings following you with their eyes? Did someone just creek open the door down the hall? 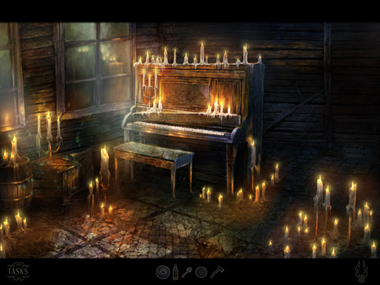 The music is also a perfect dreary fit and the spooky whispers will send chills down your spine. Feel a bit closer to solving the mystery behind your stormy night? Play Phantasmat, it’s the only way for you to escape this spooky reality and return to life as you once knew it! Just love playing these games. free ride games are GREAT. It sounds like a good game. I played this game and it was lots of fun and it was very challenging I recommend to play it..
MY NORTON 360 WILL NOT ALLOW THIS GAME, BECAUSE IT HAS HIDDEN THREATS TO MY LAPTOP. I loved the story line. It was a challenge but so much fun. I enjoyed the game. This is an awesomest game, I ever played. Nice game line and hours of fun. Beautiful background scores. Loved it. Thank u Freeride games for such an amazing hidden stuff. Hoping for more n more n more. This is one of the best games that I’ve played! I really enjoyed it! Is there another game that comes close to the challenges…storyline and excellent scenes that Phantasmat has going for it? Please keep them coming! i love all of your hidden objects games,this was an awesome game.ive played everyone of them some ive played more than once.it only goes to 46.do you have more?thank you so much for letting us play these free.thank you again. good game, but needs better instructions, on puzzle game, the last puzzle in the sewer. the instructions for the last puzzle in the sewer are poor. I loved this game so much I played it twice. I am now going into rehab with withdrawal symtems. This is one of the most awesome game I have ever played!! This is one of the reasons why i love free ride games, they bring good games like this one. Please keep bringing awesome games!! it would be brill if you would let me play the game instead of talking to you!!!!!!!!!! This is a most challenging game. Keep bringing these awesome games to us!! Great game. Kept my interest throughout the whole story line. Flashbacks were neat and the music kept the whole game spooky and great fun! KUDOS to the game designers. You have the best games on the web! i loved this game it was fun but spooky at the same time. keep puting more and more games out. this game looks like it is going to be really fun , i cant wait to play it . thank you for offering these great free games! i really love them and im enjoying playing them THANKS AGAIN!!!!!!! This is a great game and I’ve been enjoying it immensely … until getting stuck at the third intersection in the sewers, when the lights don’t work. I’ve deleted the game, reloaded and played from the beginning again, with the same result. Any hints, please, anyone? at the elevator and the cliff. I absolutely loved this game, in fact I have played it twice. Most likely will play again some time. This is one of my all time favorites. Great, great, love them , enjoy playing them very much , thank you so much for thsa free games. I love this games, it has a great story-line. This Awesome game is very challenging. I’ll be glad if you will offer more games like this one!!! This one is a terrific game. It is also free. Absolutely wonderful. 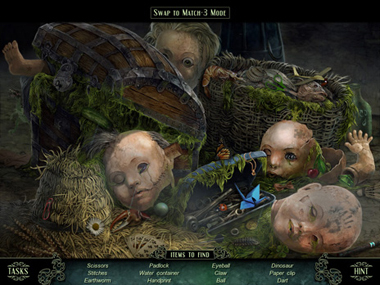 This is one of the BEST hidden-object game I’ve played so far!!! Plenty of searches, plenty of interaction and plenty of puzzles to solve! Absolutely brilliant – keep’em coming guys!!! I love this game its one of the best games I have played. thank you Free Ride Games. Amazing game! I enjoy playing it with my boyfriend too. I would love to have more and more games of this kind. I love and enjoy playing this kind of game, hope you have more challenging games like this one.